In the ancient Tibetan culture, while it is the men that rule the roost, it is actually the women who do most of the hard work. However, while Tibetan women have long been given equal rights by Tibetan tradition, historical documents have often described the Tibetan women as being gentle and hardworking. Something that has never been used to describe Tibetan men in history. In most of the ancient societies of Tibet, the men are tasked to do the harder jobs, mainly requiring physical strength, while the prominent women have traditionally been the ones that are busy throughout the day. While Tibetan prominent women have rarely been given a place in the annals of history, there are a few that have made major contributions to Tibetan history and even been praised in the region by the historians of both ancient and modern Tibet. And it is noticeable that, when these women come to the forefront of History in Tibet, it is for the most dramatic changes and influences to the Tibetan culture, religion, and history. The religious destiny of Tibet began with the introduction of Buddhism to the plateau in the 7th century, under the guidance of the First Emperor and 33rd king of Tibet, Songtsen Gampo. However, the defining moment in Tibetan Buddhist history began with the persuasion of the Emperor’s wife, Princess Bhrikuti Devi, the daughter of the Nepali Licchavi king. A proactive personage in the endeavor to make Buddhism the national religion of Tibet, coming from a major Buddhist tribe in Nepal, Bhrikuti is credited with the building of the first Red Palace, on the site where the modern Potala Palace now stands. The palace was originally constructed using Newari craftsmen, as well as the Tibetan laborers, and other temples and monasteries across Tibet were built on her bidding. While the legacy of Bhrikuti has included the development of the classical Tibetan written script, in which all Tibetan Buddhist scriptures are now written, in her own country, she is all but forgotten. In Nepal, only a small area of Kathmandu remembers her, and even that is only in the cheap goods sold to tourists. One of the most towering figures in Tibetan history, Yeshe Tsogyal, also known as the “Wisdom Lake Queen”, was a Princes of Karchen, who became the consort of the great Padmasambhava, otherwise known in Tibet and Bhutan as Guru Rinpoche. She was also one of the few female Fully Enlightened Buddhas, and responsible for the depositing of precious texts and blessings across Tibet. Born into a royal family of the Karchen clan, she was taken into the harem of the Emperor Songtsen Gampo at a young age, after being brutally raped and mistreated by her suitors. 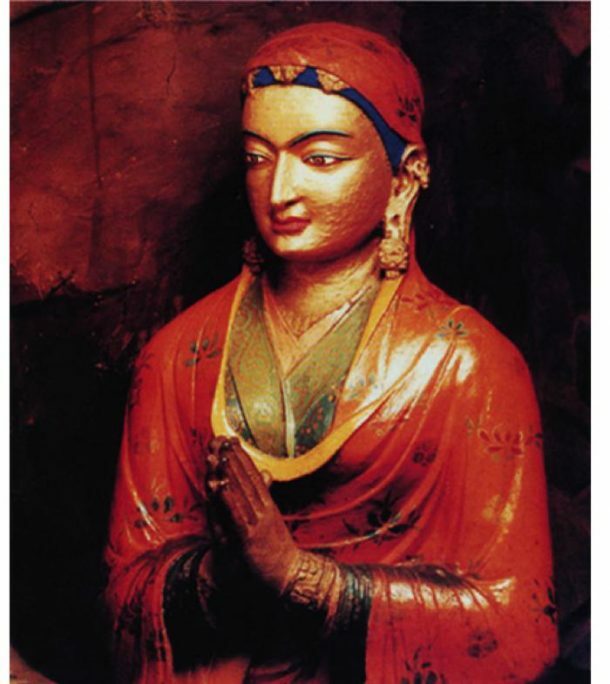 She was later gifted to the Guru Rinpoche by the Emperor. 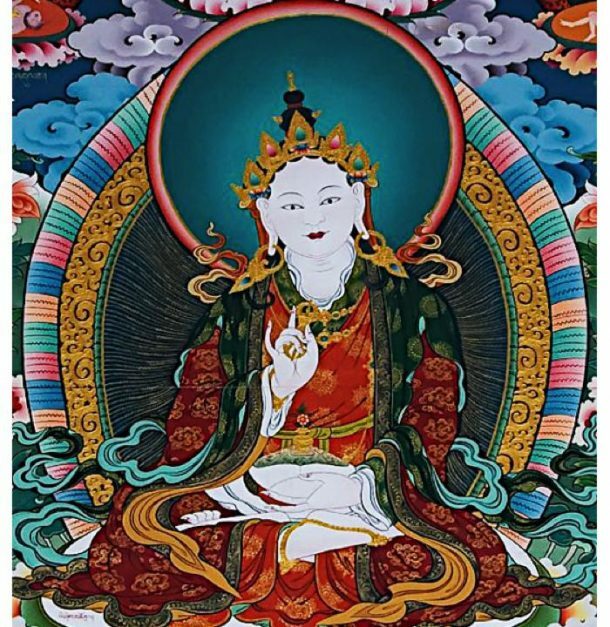 Padmasambhava set her free and she became one of his disciples, at the tender age of just 16. A woman with an amazing memory, she memorized vast amounts of the Buddhist texts with little difficulty, and was soon made the caretaker of the entire Khadro Nying-t’ig teachings. It was under the instruction of Padmasambhava that she traveled to Nepal to find the disciple Atsara Sale, who Padmasambhava predicted would become one of the consorts of Yeshe Tsogyal in later years. It was in the cave at Paro Taktsang, in Bhutan, that she conditioned herself to the Buddhist disciplines, and came to the edge of Buddhahood. Originally credited as being one of the two founders of Tibetan Buddhism, Yeshe Tsogyal is rarely found in most modern writing about Tibetan Buddhism, and it is normally credited to guru Rinpoche alone. However, Yeshe Tsogyal traveled extensively in Tibet with her beloved Padmasambhava, and in around 796 AD she went into a meditation retreat, from which she did no emerge for nine years, long after her Guru had left the Tibetan plateau. When she did emerge, it was as a fully enlightened Buddha, and she spent the remainder of her life teaching Buddhism to her own disciples, until her transcendence in around 837 AD. Possibly more famous in Tibet than the Nepali Princess Bhrikuti Devi, Princess Wencheng was the daughter of the Tang Dynasty’s prince, Rencheng Daozong Li, and a cousin of the Tang Emperor, Taizong. An involuntary member of the imperial “marriage alliance” policy, when the Tibetan King, Songtsen Gampo, demanded a Chinese Princess to cement an alliance, instead of the usual subservient rituals, she was the one eventually chosen to go to Lhasa in Tibet to be married to the Tibetan Emperor. 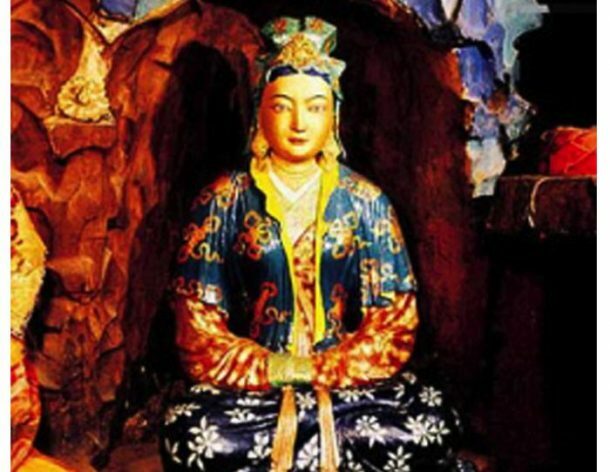 Known in Tibet as “gya mo bza”, of Chinese Wife, Princess Wencheng was credited with partially bringing Buddhism to Tibet, along with her co-consort Bhrikuti, and in 641 AD, she made the long journey to the Tubo Kingdom. Her entourage to Tibet brought with them many items, including seeds, crops, and new agricultural methods, and Buddhist scriptures, as well as the famous statue of the Sakyamuni Buddha that now resides in the Jokhang Temple. It was for this statue that the Jokhang Temple was built, and the site was formerly a pond, which was filled in with earth. The princess and the Emperor planted the willow tree outside the completed temple, later dubbed as the Tang Willow, and the princess is also credited with the building of the Tradruk Temple in Nêdong, where a thangka embroidered by the princess herself still hangs in one of the chapels. And her legacy lives on in Tibet, with countless songs and poems singing her praises, two days of celebrations dedicated to her, and the stunning gilded statue of her in the Jokhang Temple, which is still worshipped and displayed for all to see. The greatest woman in Tibet is not actually a factual person, but a rock ogress known as Ma Drag Sinmo. According to the ancient myths of Tibet, a monkey was sent to Tibet by Avalokiteshvara (Chenrezig) to cultivate the high plateau. One day, a raksasi (rock ogress) came to the monkey and demanded that he marry her. When the monkey refused, the raksasi threatened to marry a demon and fill the plateau with countless devils as her offspring, plunging the world into chaos. The monkey sought advice from Avalokiteshvara, and she told him that it was his fate, and a good deed for the plateau, so the monkey agreed to the marriage. So the monkey and the ogress married, and she bore him five human offspring, who were to become the ancestors of the Tibetan people. According to the legends, without Ma Drag Sinmo, Tibet’s most prominent female, there would be no Tibetan people in the world. Previous postHow Do I Get a Tibet Travel Permit? Next postIs Tibet Worth Visiting?